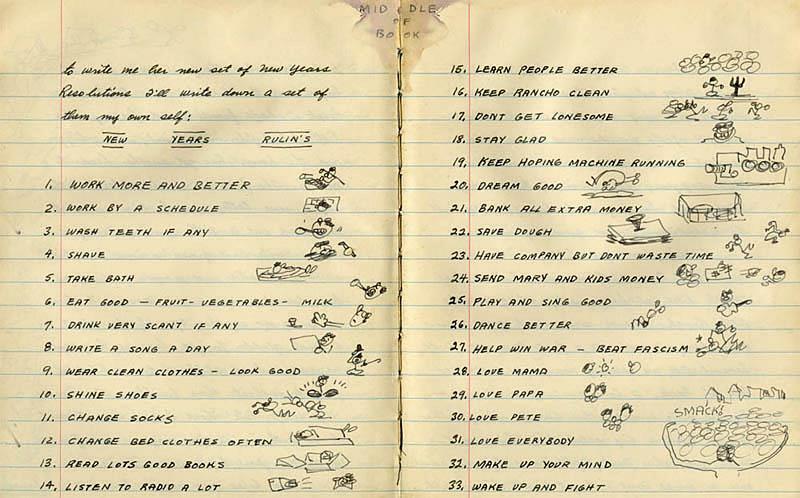 The picture above is from Woody Guthrie’s 1942 diary, in which he wrote down his New Year’s Resolutions. They’re pretty friggin’ amazing. Equally so is the song linked below by Matthew Grimm, an heir to Woody’s legacy as the best damn songwriter kicking around North America. As with Woody before him, Matthew knows that you don’t coddle fascists or humor wicked and greedy bastards. You do what the song says. You Wake Up and Fight. We implore you, in 2017, to use your guitar, your words, your brains and your hearts to slay the fuckers. Also, y’all should know more about Matthew Grimm. If Woody were still alive, he’d likely be in Grimm’s Madison, Wisconsin apartment, working on a collaboration. He’s that good. Find him. Buy the songs he’s recorded in order to provide him with enough jack to record the next one, then the next one, then the next one. That they might guide us through the darkest nights. And number thirty-three, Wake up and fight. Click here to download this song or the whole damn album.